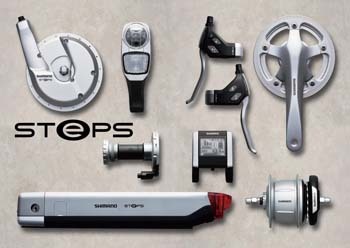 " Shimano is presenting a completely new component concept for e-bikes named STEPS (Shimano Total Electric Power System). The development is based on our philosophy that an e-bike has to stay a bicycle and needs to have a smooth and natural handling with a well-balanced support while pedaling. The STEPS concept enables people to enjoy nature and to stay healthy. E-bikes with STEPS technology have a similar riding feeling as a regular bicycle with a well-balanced support that continues until a maximum speed of 25 km/h. The 250W front motor drive system contributes to a good traction in various road conditions and can be used for recharging the battery when riding downhill, using the motor as an additional brake similar to engine-braking with a car. STEPS can be combined with several shifting options. Most advanced is the SHIMANO SG-E500 8-speed internal geared hub that operates with electronic shift buttons. Options for V-brake and roller brake will be available. Furthermore, STEPS can also be combined with NEXUS internal geared V-brake and roller brake hubs and with existing rear derailleur systems. With the introduction of STEPS, Shimano offers an integrated e-bike component group that will deliver cycling pleasure to a wide range of consumers. The official launch of STEPS will take place at the Eurobike show in Friedrichshafen, Germany, which will be open to consumers on September 4th. Availability in the market from: December 2010 "
I am intersted in your e-kits for bicycles like your sole agent in Peru, please if your are agree,, send me catalogs & FOB prices. Sorry! We can't suport your concern.